There’s a restaurant in Danville called Pete’s Brass Rail and Car Wash. Because they are famous for all the different beers they carry, I wanted to see if they had one particular brand we had in Canada last month. I just picked exactly the wrong day to go see. We planned to meet up with Team Bandler and Team Munson. Nobody told us that tonight was Hot August Nights in Danville–the main street was blocked off so dozens of car fanciers could show off their well-kept hot rods, and thousands of people could walk down the main drag and admire them. This means no place to park, this means that the restaurant is jammed beyond capacity, the double bill of disaster for a casual dinner with friends. Nonetheless, we braved the traffic and plunged into the crowds. I used my infallible parking karma to manifest a spot a block away. Mike, Linda, Bob and Nancy were sitting on a low wall in front of the joint, waiting for our table. Lots of waiting–it took almost an hour to get a spot for 6. Eventually, we were shown to our table. 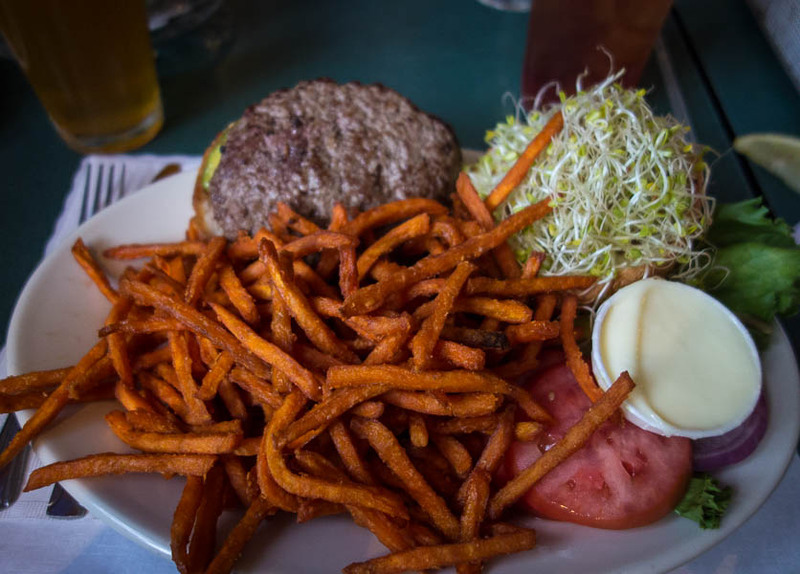 Pete’s is a very casual joint, specializing in burgers and beer. We were the oldest people there by a wide margin. The music is loud, the crowd is animated and the noise level is ghastly. 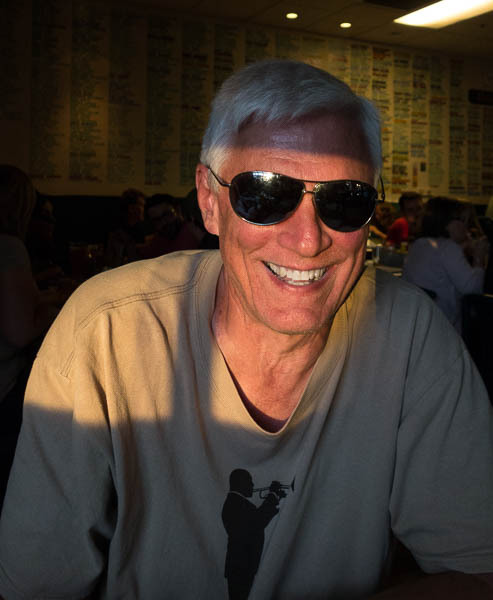 Then we notice that Bob had his sunglasses on at the table–the setting sun was bouncing off a window across the street and reflecting right into his eyes. The good news is that the light was perfect to make him look like a movie star. He may start using this photo in his passport. Danville burger, hold the bacon. Still enough calories to power a bulldozer. There were so many fries I had to commandeer a small plate to make room to assemble the burger. It was cooked the way it was ordered, medium rare. Absolutely worth the $12. Gail is avoiding wheat these days, so she had a chili burger, hold the bun. 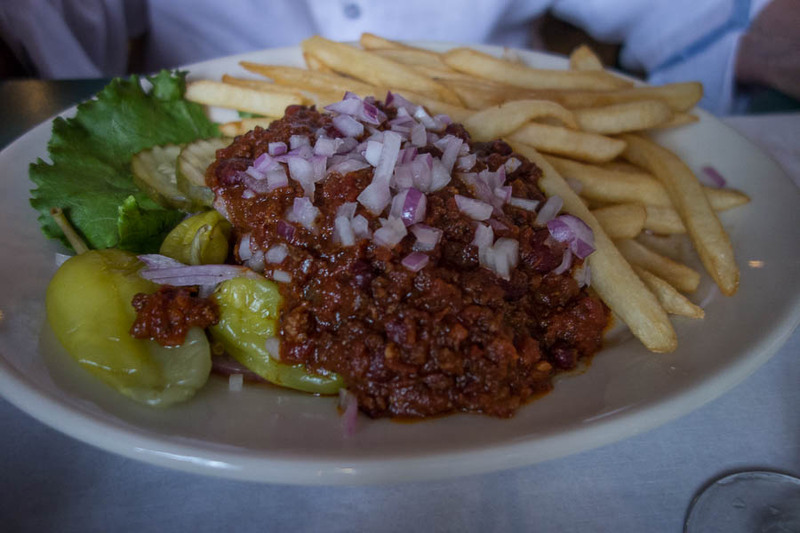 You can’t see the large bowl of salad this comes with, just trust me. Pete’s features about 20 beers on tap, constantly rotating among the vast sea of beer produced worldwide. There is a hall of fame on the wall for people who have tasted many, many of them–our friend Randy Corr is closing in on having tasted 2000 different beers, but he says he can quit any time. I had a glass of something with Naked in the name, and ordered an iced tea just to be safe. The beer was good but there wasn’t any nakedness involved and I probably preferred the iced tea anyway. Service was incredibly fast for a joint so busy. We all had more than enough to eat and enjoyed what we ordered. The prices are more than reasonable. I’d say the place is a winner if you don’t mind the noise and the wait for a table. About the name—there is no brass rail. There is no car wash. There may or may not be anyone named Pete. Don’t try to understand it, just go with the flow and have another beer. So….what was the beer you had in Canada? Maybe I can bring some to you sometime. It was a Spanish beer called Alhambra. It comes in a green glass bottle with no label—the glass is embossed with the name. Think I had some when in Spain this spring. I remember that bottle. Will have to try it again in a couple of weeks when in BCN.